The President, Shri Ram Nath Kovind addressing at the 83rd Convocation of Dr. Bhimrao Ambedkar University, in Agra on December 05, 2017. 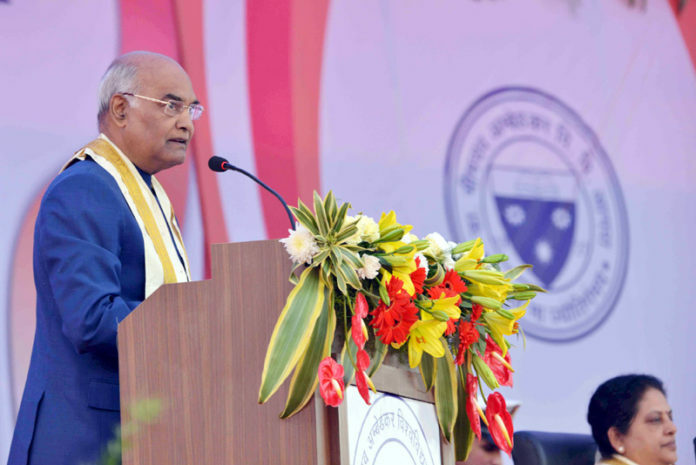 Agra: The President of India, Shri Ram Nath Kovind, graced and addressed the 83rd Convocation of the Dr Bhimrao Ambedkar University, Agra, today (December 5, 2017). Addressing the students, the President said the University had an illustrious history going back nearly nine decades and had produced Presidents, Prime Ministers and stalwarts in many walks of life. He urged the students to see the convocation not as the end of a journey but the commencement of a new phase of responsibility and learning. He also said that many people had contributed to their education – their parents, teachers, family members, and others in government and society. These people had contributed to giving the graduating students an opportunity that millions in our country are unable to get. Therefore, it was the duty of the graduating students to pay back society in some way, and work for the cause of humanity. The President noted that the Dr Bhimrao Ambedkar University has adopted a primary school, taken responsibility for education of underprivileged children in a model school, run cornea transplant programmes and organised blood donation camps. He appreciated such efforts and said they were commendable. Such efforts made students sensitive and responsible towards society. The President expressed confidence that the University would continue to play a meaningful role in preparing our younger generation for the challenges of the 21st century.